Keep your hand warm and your beer cold with the Beer Mitt – the world’s first beer can koozie glove! 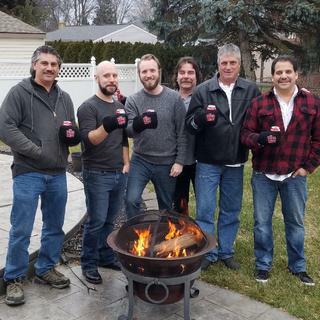 Keep your hand warm and your beer cold with the Beer Mitt – the world’s first beer koozie glove! Like other koozies, this unique glove will help insulate your beer. But because it covers your whole hand, it’s perfect for camping, fishing, tailgating, or just relaxing with friends when it’s a little bit chilly. It’s designed to fit most any size hand and it’s sure to be a great conversation starter because, well, it’s not your average beer koozie! 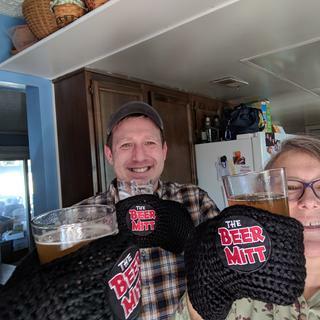 I bought 6 of these beer mitts for my brother and son in laws, and they were the hit of the Christmas party!!! Best gift given!!! The guys with their new Beer Mitts!! Thanks Keg Works!! So much fun! It really works! not made for small/ petite hands. Think its great for beers around the bonfire in Maine! it's soooo awesome!!! and a good deal! fun and will probably get used! Are these sold in any stores ? BEST ANSWER: Kegworks is the only place I've found the beer mitt. And I really love it and think it's neat. It will come in handy when winter gets here. Hi Carol, We don't have any retail locations but we do offer 2-day and overnight shipping if you need it quickly. Cheers! Is there one for a left handed person? Thank you for your interest. Unfortunately, this item cannot be customized. If you're still interested, please contact our customer care team at 716-362-9212 who can assist you with coordinating this order.